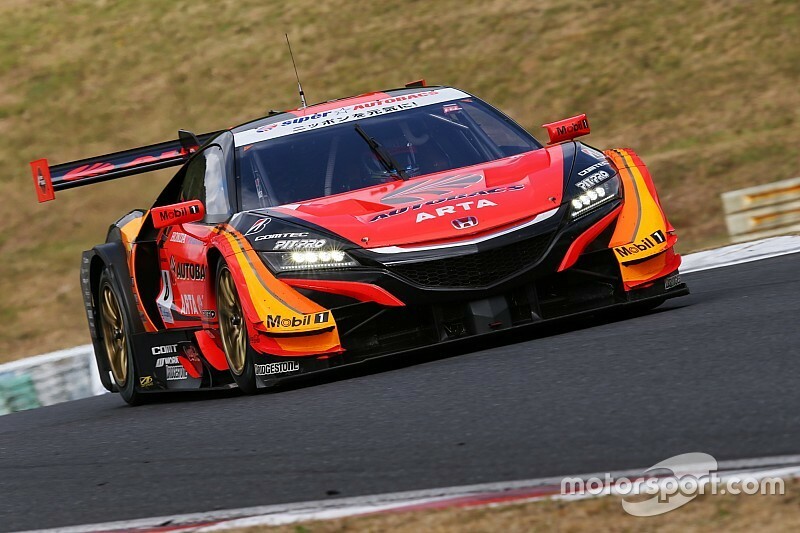 The ARTA squad led an all-Honda top three in qualifying for the Autopolis Super GT round, despite an increase in the minimum weight of the NSX-GT last month. 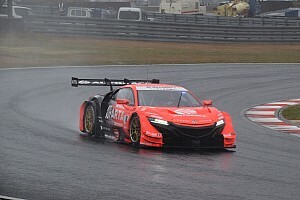 Real Racing’s Koudai Tsukakoshi set the early pace in qualifying with a 1m31.989s flyer, before Tomoki Nojiri in the ARTA NSX-GT went over half a second quicker to claim provision pole. 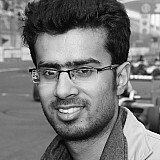 Former Formula 1 driver Jenson Button’s teammate Naoki Yamamoto was one of the last drivers to cross the finish line which put him in a prime position to score two poles in a row, but he could only manage a time of 1m32.551s. That gave Nojiri and ARTA teammate Takuya Izawa their first Super GT pole since the Suzuka round in May with their previous time of 1m34.441. Tsukakoshi, who shares the Okayama season opener-winning Real car with Takashi Kogure, settled for a front-row spot, while championship leaders Button and Yamamoto ended up third. 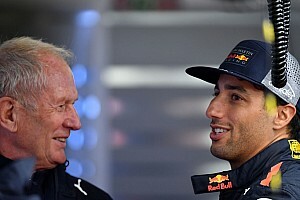 Button was nominated by Team Kunimitsu Honda for Q1 and set the fifth fastest time of the session, enough to propel his team into the second part of qualifying. Behind, the #36 TOM’S Lexus team secured the best of the rest spot in fourth with Kazuki Nakajima and Yuhi Sekiguchi beating the sister #1 TOM’S car of Nick Cassidy and Ryo Hirakawa. 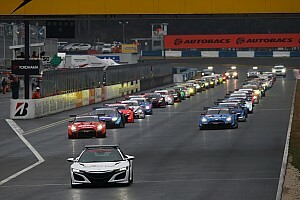 Nakajima and the #36 TOM’S team won last year’s Autopolis race, albeit with James Rossiter in place of Sekiguchi. Mugen Honda pair Hideki Mutoh and Daisuke Nakajima pipped Bertrand Baguette and Kosuke Matsuura (Nakajima Honda) by just 0.034s for sixth, while Yuji Tachikawa and Hiroaki Ishiura were slowest of the Q2 runners in the Zent/Cerumo Lexus. IndyCar-bound Felix Rosenqvist and Kazuya Oshima qualified ninth in the Team LeMans Lexus, while the top 10 was completed by Bandoh Lexus of Yuji Kunimoto and Kenta Yamashita. Nissan was well off the pace after two strong weekends at Fuji and Sugo, with none of its four cars qualifying inside the top 10. 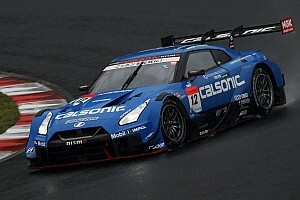 Impul finished as the Yokohama-based manufacturer’s highest-placed team in 11th, nearly a second down on the Real Racing squad that topped Q1. Button and Yamamoto currently lead the championship by 11 points from Nojiri and Izawa with 41 points still to play for in the final two rounds of the season. Newly-crowned Japanese F3 champion Sho Tsuboi put the #25 Tsuchiya Engineering Toyota he shares with Takamitsu Matsui on pole position in the GT300 class. Tsuboi lapped the southern Japanese circuit in 1m42.498s, nearly half a second clear of the second-placed #10 Gainer Nissan of Kazuki Hoshino and Hiroki Yoshida. Yuya Hiraki and Tetsuji Yamanaka qualified a further tenth behind in the Teach Mach Toyota, making it two ‘mother chassis’ cars from Toyota inside the top three.